Ross McEwan CEO of NatWest addresses the audience. The 900sqm fit out within NatWest Regents House on Islington High Street, designed by LOM architecture and design, FDP’s sister company, is the accelerator’s thirteenth location in the UK. 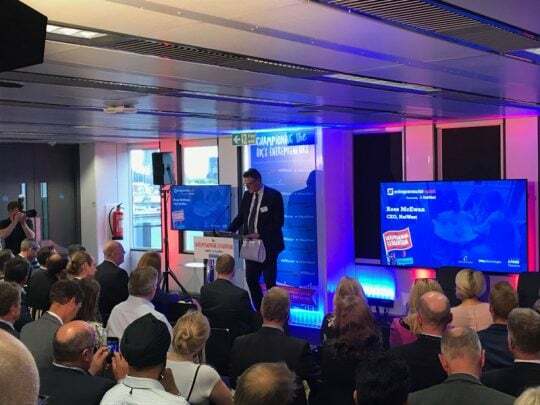 It was officially opened by NatWest CEO Ross McEwan at a special launch event attended by London’s best and brightest entrepreneurs. Through their 13 locations across the UK Entrepreneurial Spark intensively supports selected entrepreneurs to develop their business ideas. NatWest provides the office space, each state-of-the-art hub is hosted within a NatWest building, and their employees also work within the hubs to mentor the entrepreneurs. For Entrepreneurial Spark’s London hub, at Regents House, LOM has created a bright and bold interior, delivered in twelve weeks, while the rest of the building remained occupied. The 900sqm floorplate has been optimised to accommodate more than 150 individual Spark members, across a variety of work settings, as well as an event space and refreshment area. The hub has a refined industrial look and feel with a tactile material palette and bright highlight colours on a neutral backdrop. A combination of open plan desking, collaboration and focused work areas provide places to meet, brainstorm and concentrate. The flexible events space for up to 100 people, the most crucial area of the hub, is where the entrepreneurs learn to pitch their ideas and meet business leaders.